Late last month we got word that the sportiest of all ATS Coupes would be coming to the Los Angeles Auto Show packing a pair of turbochargers, and around the same time, spy photographers captured the ATS-V completely undisguised as it was being unloaded for a photo shoot. Now official shots of the coupe have leaked online, and some specifics about the powertrain have come along for the ride as well. 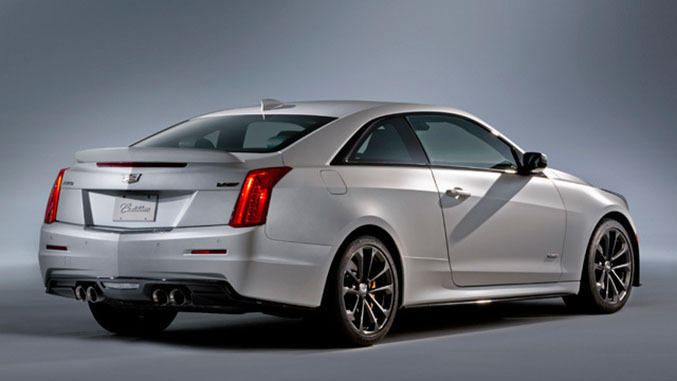 The ATS-V will indeed receive the 3.6-liter, twin turbocharged V6 from the CTS Vsport, but with additional high-performance components for use in the ATS-V. Modifications to that engine include titanium connecting rods, two water-to-air intercoolers, and titanium turbines for the turbos, which all help to bring the engine’s output up to 450 horsepower and 443 pound-feet of torque, up 30 hp and 13 lb-ft from its configuration in the CTS. 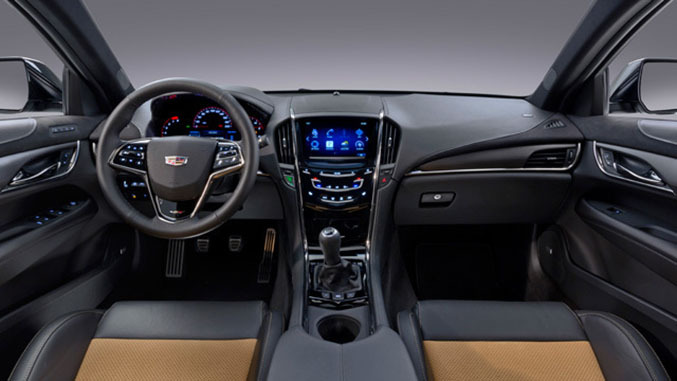 That power will be sent to the rear wheels through your choice of an eight speed automatic or a six-speed manual transmission with C7-style rev matching, and should be enough to get the 3600-pound ATS-V from 0-60 mph in 3.9 seconds on its way to a 185 mile per hour top speed. The business of slowing things down will be dispatched 14.5-inch discs clamped by six-piston Brembo brakes fitted up front and four-piston units grabbing 13.3-inch discs in the rear. The third generation version of Magnetic Ride Control will take care of the damping duties and the suspension boasts 50 percent more roll stiffness than the standard ATS Coupe. Visually, the ATS-V will come sporting beefed up bodywork, a carbon fiber front splitter, massive brakes, and the tell-tale chrome mesh grill treatment that we’ve seen on previous V models. The report also states that if that’s not enough visual moxie for you, Cadillac will be offering a performance package that employs a different front splitter, side skirts and rear spoiler for additional high-speed downforce. Production is set to begin in the spring of 2015, with pricing expected to be announced closer to launch. § An interior with high-performance seats and ergonomics focused on the driver’s interfaces with key features for performance driving. § Lightweight titanium connecting rods that reduce inertia of the rotating assembly, complementing the quick-spooling turbochargers. § V-braces for the engine compartment. § A Brembo high-performance brake system provides durability, consistency and the capability for track-day performance. The system includes 14.5-inch-diameter (370 mm) front rotors with staggered six-piston calipers and 13.3-inch-diamter (339 mm) rear rotors with four-piston calipers. § The rocker moldings and rear spoiler are aero-optimized. § OnStar 4G LTE connectivity with built-in Wi-Fi hotspot.